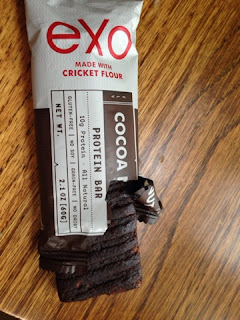 During my search for the cleanest protein bar that I don't have to make I came across this little gem: the EXO bar. It is gluten, soy and dairy free. 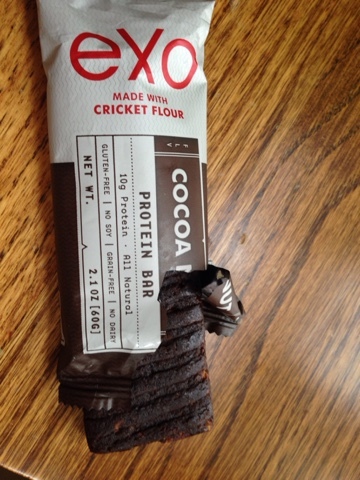 And get this, the protein in it is cricket...yep...like the ones that sing you to sleep with their chirping in the summer; WHAT?! I know, right? BUT check this out...crickets are higher in protein per 100 grams then eggs and beef. Plus, they have a smaller carbon footprint than the animals we get protein from...so eating crickets is environmentally friendly. But how does it taste? Overall, it is a fine bar. It's sweetened with dates, it has a good amount of protein and fiber and at 300 calories a bar, it could be a meal replacement. You won't find any legs or antennae in the bar since the crickets are dried and ground into "cricket flour" ...so that's a plus. I brought some for one of my classes to sample (lucky ducks) and everyone tried one....and some even had seconds. So if you are looking for an all natural bar, this one might be on your "try" list...enjoy :) Just food for thought...chirp chirp. 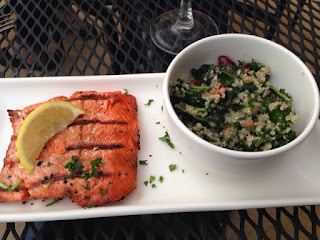 We grilled three times in the last 4 days...spring is basically here! No matter what you are throwing on your grill, make sure you are grilling a ton of veggies. You can do just about any vegetable on the grill but my favorites are bell peppers (any color), onions and zucchini. Even if you don't have a fancy veggie basket for your grill, you can totally just skewer them to make kebabs or use some heavy duty foil to keep your stuff from falling through the grates. 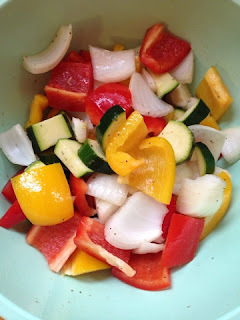 My favorite way to pull out the flavor of grilled veggies, is to toss them in a bit of olive oil and then sprinkle with a mix of salt, pepper, garlic powder and onion powder....sooooo good-and good for you! 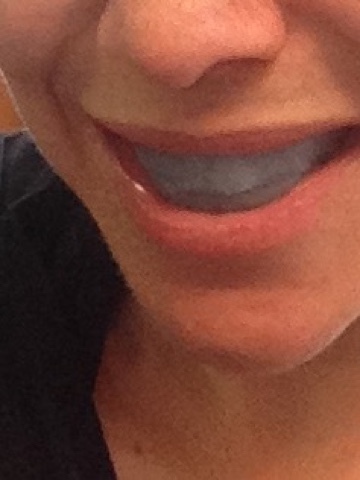 You know what you can do when you have white strips on your teeth-EAT. And all food/drink other than water tastes totally nasty after you take them off. Do some jumping jacks or jump squats-sometimes you may have a dip in blood pressure and just need that to come up a bit-I do this all the time. Okay..if you do all of those things and you are still super hungry...you may actually BE hungry...so eat an apple with peanut butter or a couple cups of air popped popcorn and some almonds or a bunch of veggies and hummus.